The global micro data center market is gaining from the changing data center needs of enterprises. A large number of enterprises are increasingly adopting micro data centers to store critical data either on premise or in remote locations. Micro data centers exhibit virtues of simplified workload that traditional data centers lack. As a result, enterprises are switching from local facilities to automated micro data centers for information storage. Some other features of micro data centers include scalability, customizability, cost effectiveness, and are self-contained. In addition, micro data centers are portable and occupy very less space as compared to traditional data centers. Nevertheless, micro data centers are equipped with components of traditional data centers such as in-built cooling systems, security systems, fire suppression systems, monitoring systems, telecommunication and storage system, and uninterruptible power supply (UPS). A report by Transparency Market Research (TMR) estimates the global micro data center market to rise at an impressive 21.1% CAGR over the forecast period between 2017 and 2025. At this pace, the market will be valued at US$14,813.2 mn by the end of 2025 from US$3,208.9 mn in 2016. The global micro data center market is broadly categorized on the basis of rack size, end use industry, and geography. On the basis of rack size, the market has been bifurcated into less than 25 U, 25 U – 40 U, and more than 40 U. Among them, the more than 40 U segment holds the leading market share; the segment accounted for 54.0% revenue contribution to the overall market in 2016. However, less than 25 U segment is anticipated to display the leading CAGR over the forecast period. Based on end-use industry, the global micro data center market is segmented into IT and telecom, retail, education, BFSI, healthcare, energy, and others. Of them, in 2016, IT and telecom held the leading revenue share in the overall market. However, the retail segment is predicted to display the leading CAGR over the forecast period. The growth of the retail segment is mainly because of expansion of ecommerce and rising adoption of micro data centers for point of sale systems for improved efficiency and productivity. On the basis of region, the segments into which the global micro data center market is divided are North America, Asia Pacific, Europe, the Middle East and Africa, and South America. North America, among all, is currently the leading regional market for micro data center. In 2016, North America held 43.2% revenue of the overall micro data center market. Going forward, North America is estimated to display an impressive 18.6% CAGR over the forecast period. The growth in the region is mainly because of significant demand for micro data centers from IT and Telecom verticals in the U.S. and Canada. The retail sector also accounts for significant revenue contribution to North America micro data center market. Europe is currently the second leading market for micro data centers. The growth in the region is mainly because of increasing demand for IT convergence and integration among enterprises from a host of industry verticals. Due to the rising demand, a number of regional players have emerged in the region to provide cost effective micro data center solutions to end users. In Europe, the U.K. is anticipated to emerge as the leading domestic market in 2017. 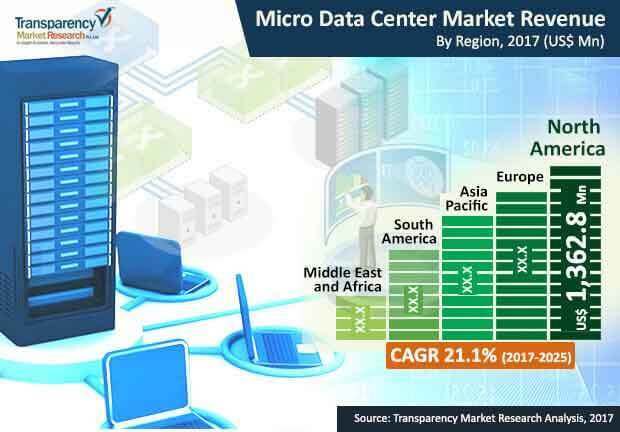 Leading players in the global micro data center market include Eaton Corporation plc, Hitachi Ltd., Panduit Corp., Zellabox Dataracks, Hewlett Packard Enterprise Development LP, Instant Data Centers, Huawei Technologies Co. Ltd., Rittal GmbH & Co. KG, and Schneider Electric SE. This report on the global micro data center market provides analysis for the period 2015–2025, wherein 2016 is the base year and the period from 2017 to 2025 is the forecast period. Data for 2015 has been included to provide historical information. The report covers market dynamics including drivers, restraints, opportunities, and trends expected to influence the global micro data center market growth during the said period. Technologies that are playing a major role in driving the global micro data center market have also been considered in the study. The study provides a comprehensive analysis of the market growth throughout the above forecast period in terms of revenue estimates (in US$ Mn), across different geographies. The micro data center market has been segmented on the basis of rack size, end use industry and region. Based on rack size, the market has been further classified into less than 25 RU, 25 RU – 50 RU and more than 50 RU. By end use industry, the micro data center market is classified into IT and telecom, retail, BFSI, healthcare, energy and others. Geographically, the report classifies the global micro data center market into North America, Europe, Asia Pacific (APAC), Middle East & Africa (MEA), and South America; the regions are analyzed in terms of revenue generation. Furthermore, region wise prominent countries covered in the report include the following - U.S, Canada, U.K., Germany, France, Japan, China, India, GCC countries, South Africa and Brazil. The report also includes functional model in micro data center market. Porter Five Force analysis which identifies bargaining power of supplier, bargaining power of buyer, threat from new entrant, threat from substitute and threat from competition in micro data center market is also included in the report. Ecosystem analysis which identifies key stake holders in the micro data center market is also covered in the report. Segment trends and regional trends have also been added in micro data center study. Additionally, the report also covers segment wise comparison matrix, market attractiveness analysis and market positioning of key players for all regions covered in the scope of study. Furthermore, the report includes competition landscape which comprises of competition matrix, market share analysis of major players in the micro data center market based on their 2016 revenues, and profiles of major players. Competition matrix benchmarks leading players on the basis of their capabilities and potential to grow. Factors including market position, offerings and R&D focus are attributed to company’s capabilities. Factors including top line growth, market share, segment growth, infrastructure facilities and future outlook are attributed to company’s potential to grow. This section also identifies and includes various recent developments carried out by the leading players of micro data center market. Company profiling includes company overview, major business strategies adopted, SWOT analysis, and market revenues for year 2014 to 2016. The global players profiled in the global micro data center market include Eaton Corporation PLC; Hitachi Ltd., Panduit Corp, Zellabox, Dataracks, Hewlett Packard Enterprise Development LP, Instant Data Centers, Huawei Technologies Co., Ltd., Rittal GmbH & Co. KG and Schneider Electric SE. have also been added in the report.